Francis McManus was born Pomeroy about 1891. He enlisted in Dungannon prior to the war on 15th November 1913, in the Special Reserve of the Royal Inniskilling Fusiliers. He was living in Pomeroy at the time. 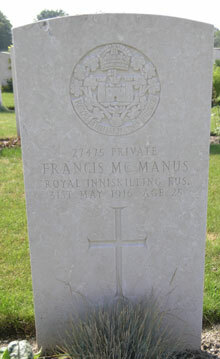 Private McManus also served for a time with the Royal Dublin Fusiliers (No. 21324). Private Francis McManus was serving with the 7th Battalion of the Royal Inniskilling Fusiliers when he died of wounds on Wednesday 31st May 1916. He was 25 years old. In his Will, Francis McManus left all to his uncle, Neal Conway, who lived at Lime Hill, Pomeroy. Philosophe lies between Bethune and Lens. From the Lens-Bethune road (N43), follow the D165E road for 400 metres to a right turn. The cemetery lies to the left 100 metres along this track. The first CWGC sign for the cemetery is at the junction of the N43 and the D165E.